COLLECTORS! MUSIC LOVERS! VINYL HOARDERS! AGING HIPSTERS! LISTEN UP! Across the US, vinyl enthusiasts celebrate RECORD STORE DAY™ in April. We're doing our event a week later than the national holiday, so we'll have to have TWICE THE FUN! This year, join HPPR for our 2nd Annual POP-UP VINYL SWAP! It's at The Rocking OT (3100 SW 6th Ave., Amarillo) on Saturday, April 20th from 12:00p to 3:00p. 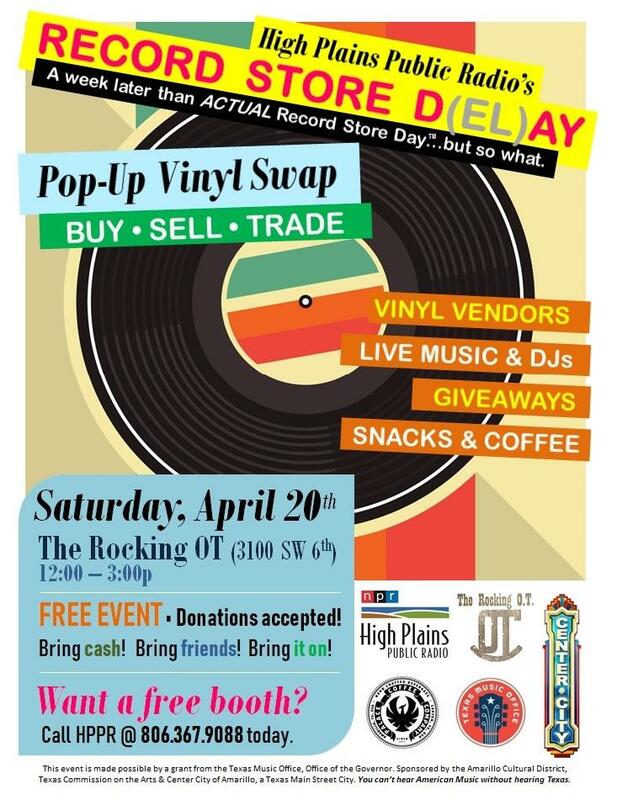 We're calling this event "Record Store D(el)ay" since we're a week later than the trademarked national event, but we promise cheap vinyl, refreshments, great company, and a chance to mingle with other record collectors across our region! Plus, we'll have LIVE MUSIC & DJs, so it's also a Living Room Concert! BUY! SELL! TRADE! New and used vinyl! Help spread the word! Are you a collector with too many albums? GET A FREE BOOTH! Space is limited, so reserve some table space today. Just call HPPR to reserve your space: 806 367 9088. You can also email Jenny here. This project has been made possible by a grant from the Texas Music Office, Office of the Governor. Sponsored by the Amarillo Cultural District, Texas Commission on the Arts and Center City of Amarillo, a Texas Main Street City. You can’t hear American Music without hearing Texas.